When I’m traveling, I often check multiple map applications to find the best route (which undoubtedly confuses Navigon, the navigation app I actually use en route). For traveling northeast from Round Rock to St. Louis or Michigan, this meant discovering the quicker Highway 69 instead of the bigger Highway 44 that my navigation app wants me to use to get across Oklahoma from Texas. Highway 69 is not only faster, but it’s also more interesting. Book-wise, hidden a quick one block off of 69 in Pryor is The Book Exchange. Pryor is about ten miles north of Chouteau, where I often stop for food at either the Dutch Pantry or the Amish Cheese Shop. The former is a nice meat-and-potatoes place and the latter a nice sandwich shop and they’re both about halfway to St. Louis. But while there are a lot of food options available on Highway 69—including in Pryor, and I’ll have to try some of them now that I’m stopping there all the time for books—there are very few bookstores, at least as far as I can tell. 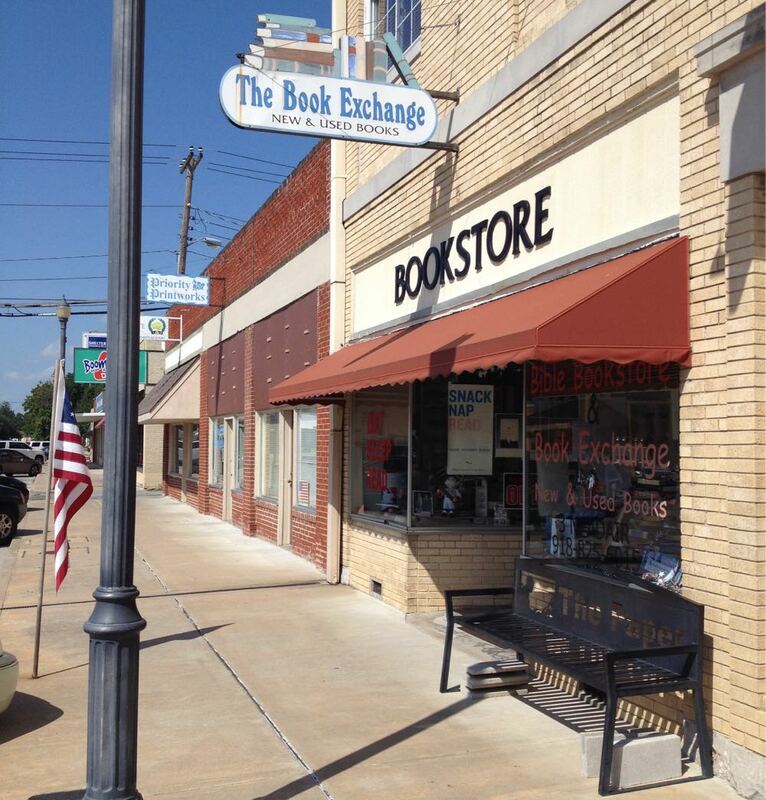 There’s a Hastings in Muskogee, but it didn’t have much in the way of books when I went there a few years ago.1 The Book Exchange is a real oasis on this route. Its only real drawback is that it’s a haggling-style store: most books don’t have prices, so you’ll need to ask for an offer and then decide if it’s worthwhile to buy at that price, make a counter-offer, or just put the book back. But so far the prices (as you can see) have been quite reasonable. 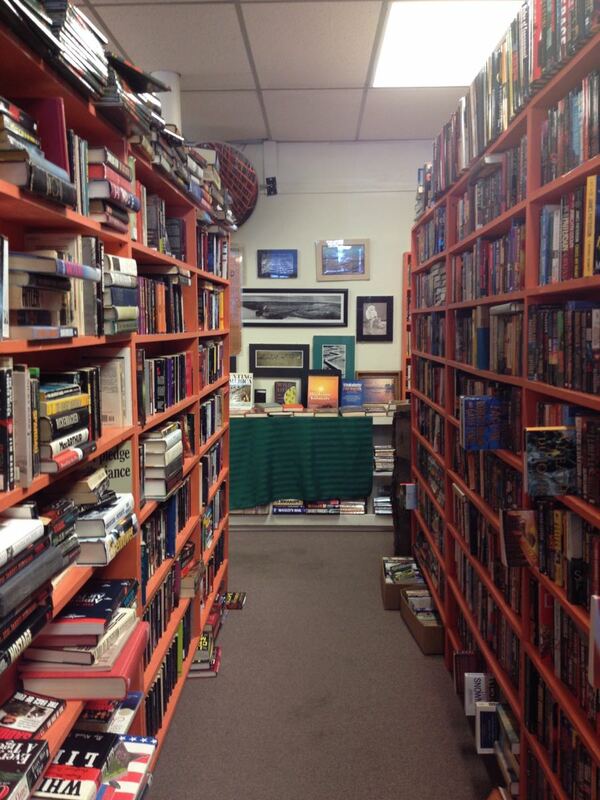 They have a nice selection of fiction, including thrillers/mysteries and science fiction/fantasy, and much more. As you can see from the list of books I’ve picked up here over my last two trips, I’ve found some nice older science fiction paperbacks. I’d been meaning to read Clifford D. Simak’s City for quite a while and bit because of the neat old dog-man-robot cover painting. And earlier, I picked up my first Clark Ashton Smith book here, which was disappointing only in the sense that I hadn’t read it decades earlier! The books on the shelves are mostly in order. The table down the end is the local-interest table. They also have a table set aside for local-interest books and a very good selection of spiritual and religious, especially Christian, books. If you’re looking for passenger reading material on the trip north or south through Oklahoma, I don’t think you’ll be disappointed if you stop here. In response to The bookstores less traveled: These aren’t the bookstores people travel across the country to visit. But if you’re already traveling across the country, you’ll want to take advantage of the opportunity to visit them. Or there was a Hastings; apparently they’ve closed all through Oklahoma. Coas Books is a chain of two bookstores in Las Cruces, and well worth the visit. The Palestine Public Library opens their booksale room about once a month. If you’re in the area, it’s well worth a look. The Georgetown public library book nook is possibly the best library bookstore I’ve been to. Pryor Oklahoma: The Book Exchange on Highway 69 last modified June 6th, 2017.